Action bar (ActionBar) was introduced from API level 11. 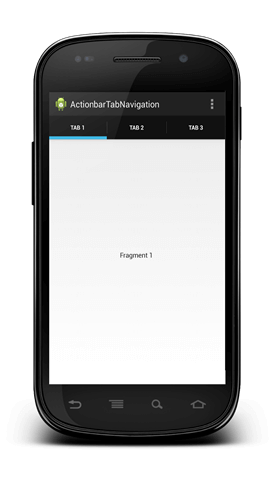 In this post I will explain how to create actionbar tab navigation using fragments. The final result is shown below where user can move between tabs. Just notice that we pass the fragment index using arguments bundle (line 2,3).Now we have our fragment we have simply to implement the listener. We can make our Activity implements the listener so that when user selects a tab we show the relative fragment. Fragment f = null;   // Thx to Andre Krause for his support! Whats the class of the object fragList refers to? "The method remove(Fragment) in the type FragmentTransaction is not applicable for the arguments (Fragment)"
Also what data type is "index"
The source code still gives the error, what's the solution? hey if i want to add a swipe gesture to switch between different tabs how would i do that?? what is "fragList.get(tab.getPosition());" in line 10 use for? Is there any way to easily implement swiping between these tabs? Apologies, I'm an android noob, just trying to work it out. Also, how do I define each of these fragments, so that I can have different content in each? I understand right now it is a loop to generate example fragments. I don’t know how I can stay on the selected Tab when I come back (by a back button) after I started another activity in this view? You understand what I want? I get on the third tab, click on something, a new activity starts, and I want to come back an the third tab by a button. The best would be that the tabbar still stay there so I also could select from this the other tabs. I don't know how I can stay on the selected Tab when I come back (by a back button) after I started another activity in this view? You understand what I want? I get on the third tab, click on something, a new activity starts, and I want to come back an the third tab by a button. The best would be that the tabbar still stay there so I also could select from this the other tabs. Thank you for the tutorial. I wanted to ask how we can go from tab 1 to tab 2 by clicking on a button on tab1 layout.? I want to remove the action bar or add tabs on top of action bar. I don’t want to see the application name and icon on it and remove the space . how can I do it?